The market for baby sleep devices can be very fickle. All the different objects and devices parents use to get their kiddos to sleep can gain and lose popularity very quickly. But you know what never falls out of favor? Swaddling. From newborn until either baby shows signs of rolling in either direction OR once sleep training commences, whichever happens first. While you may notice your 7 month old still appreciates the swaddle, it is dangerous to swaddle a baby once they show signs that that may even be thinking about rolling over. Also, once you start to sleep train (anytime after week 16) a swaddle is considered a sleep prop and you’ll want to immediately cease using it on the first night of training. But, in the meantime, know that swaddling properly is actually quite easy, and doesn’t require too much special equipment. Even though many special swaddle blankets have come on the market, I still recommend using a double swaddle, pairing the oldie-but-goodie SwaddleMe with a large muslin blanket (think Aden and Anais). While I could try to describe how to swaddle, a video is much better. Please know that I recommend this swaddle technique because it is dang near impossible for a baby under the age of four months to break out of, and busting out of swaddles almost always equals disrupted sleep – if we can keep the swaddle secure, baby will likely sleep more deeply, for longer stretches of time. 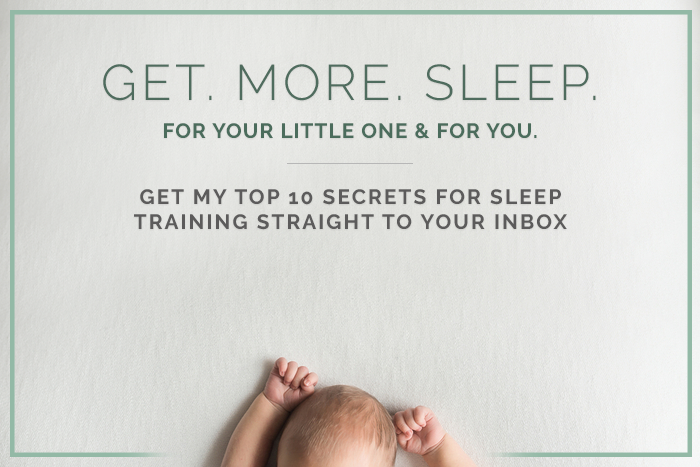 Speaking of helping your newborn sleep more deeply, for longer stretches of time…I have a newborn series coming soon! If you liked this swaddle how-to just wait for the newborn series when I give you ALL of my top tips to get you and your newborn the best sleep possible! what do you recommend dressing the baby in under a double swaddle? Just a onesie, so they don’t overheat? ty!! Hi angiebruzina! It really depends on the climate you live in and the temperature of your baby’s room, but a onesie is great as well as footed jammies – anything single layered really. Swaddling is my go to recommendation for parents of newborns because how it mimics the coziness of the womb. You have some really good tips here. I usually suggest using a muslin blanket. Are there another blankets you suggest?